The lifeguard position ensures the safety of pool patrons and assists with aquatic programs and pool operation. Did you know that from 2005-2016, there were an average of 3,536 fatal unintentional drownings (non-boating related) annually in the United States — about ten deaths per day. The average age of a lifeguard is between 16 and 18 years of age. The young lifeguard has a lot of responsibilities, each time that a lifeguard goes into the lifeguard chair he has the life of each swimmer in that pool in his hands, he or she at any given second could be face with the reality that they might have to save a life. To become a lifeguard you must first pass the prerequisite skills test which includes a 300 yard swim (100 freestyle, 100 breaststrokes, and 100 choice of freestyle or breaststroke) and you must swim 20 yards and surface dive 10 feet retrieving a 10 pound brick. Once the swimmer has retrieved the brick then the swimmer must swim 20 yards on their back while holding the brick to the original starting point. The swimmer must exit the water without using a ladder or steps. This prerequisite must be completed in 1 min and 40 seconds. The student must be able to tread water for two minutes without using hands. Once the students complete the lifeguard class they must obtain a lifeguard permit from the Louisville Metro Board of Health to work in Louisville Metro which consist of passing a Board of Health guard course (water skills) and passing a written test. Louisville Metro Parks Aquatics will be hosting American Red Cross Lifeguard classes at the Mary T. Meagher Aquatic Center at 201 Reservoir Ave. now through the end of May. The cost of the classes is $200. Anyone who is interested in being a lifeguard for Louisville Metro Parks may take the class for free! Please contact Keith Smith at the Mary T Meagher Aquatic Center at (502)895-6499 or by e-mailing me. Louisville is the home of many state champions. Most notable are those who’ve performed on the basketball court, in the boxing ring, or the baseball/football fields. But we’d like to recognize some other local champions and award winners. Louisville Metro Parks & Recreation is proud to recognize John Allen, Lewis Klien, William Hart, Shirin Rafizadeh, Jack Allen, Raymond Ho, Mark Meade, Jimmy Khong, Yao Chen, and Yueling Zhang. These are the TTCL medal winners from this year’s Kentucky Bluegrass State Games in July who participate at the Beechmont Community Center in South Louisville. Table Tennis is just one of many events which take place at the Bluegrass State Games, which was designed to provide Kentuckians of all ages and skill levels a wholesome avenue for positive and healthy development through sports and physical activity, while promoting and developing amateur athletics to provide the amateur athlete an opportunity to showcase his/her talent and receive statewide recognition. Kevin Kinney, Recreation Supervisor, Beechmont Community Center, invited me out to meet some of the players, and take a few pictures. Beechmont is the hub for the Table Tennis Club of Louisville (TTCL). Beechmont, through TTCL, offers table tennis matches at the center. “The cultural diversity and intergenerational aspects of the Beechmont Community Center table tennis program is amazing,” said Kinney. Ray said the reason why he loves Table Tennis is because age doesn’t matter. You can be eight 8 or 80, and still play. And Ray was right. On the other end of the room playing doubles was gentleman Nick (pictured in the blue shirt below), who is 81 years old. “There are sports where participants excel at a young age, such as gymnastics and swimming. And there are sports where participants can still compete at the highest level when past peak physical age, such as golf, archery and lawn bowls. But there aren’t many sports (if any) where it’s possible for an 11-year-old to get to the final of world event one month and a 52-year-old to win a tour title the next month,” said Tom Lodziak, a table tennis coach, player and blogger based in Cambridge, England. So…I asked Ray (pictured in the red shirt, below left) that one question that many of us non-table tennis players have always wondered about. Ray said nothing really other than the name. So, I checked in with the International Table Tennis Federation (ITTF) for clarification. As I read through their history, what I learned is that the first use of the name “Table Tennis” appeared on a board and dice game made by J.H.Singer in New York in 1887, showing that the phrase “table tennis” had been around at least since then. When the game started in the 1890s, various patented or trademarked names were being used by different manufacturers. So when the English sports company John Jaques & Son became the market leader in the 1920s with their version of the game called “Ping Pong”, they decided that they would only allow their trademarked name to be used. On the 12th December 1901, “The Table Tennis Association” was formed in England, and four days later, “The Ping-Pong Association” was also formed. These two associations would later merge in 1903 to become “The United Table Tennis and Ping-Pong Association”, and then would eventually change back to “The Table Tennis Association” before dying out in 1904. On the other side of the ocean, the American rights were sold to Parker Brothers. As more and more ping pong tournaments were now being organized, The Parker Brothers also threatened legal action against anybody who used their proprietary trademarked name of Ping Pong without specifying the use of their equipment. Therefore an alternative name was required for this sport and the name Table Tennis was chosen. So, since that time, and particularly since the establishment of the International Table Tennis Federation (ITTF) in 1926, the modern game has been known as table tennis. If you’re interested in learning more about Table Tennis, stop by the Beechmont Community Center located at 205 Wellington Avenue off of South 3rd Street. Table Tennis is offer on Tuesdays (4 – 8:30pm), Wednesdays (11 am – 2 pm), Thursdays (4 – 8:30 pm) and Saturdays (10 am – 2 pm). “To see people from all walks of life and backgrounds coming together with a mutual interest and different skill levels to play a friendly, but completive game is truly what makes a community a community. Louisville needs more programs like this,” said Kinney. Metro Parks and Recreation and the Army Corps of Engineers recently hosted its second public meeting on the “Beargrass Creek Trail Conceptual Shared Use Path and Ecological Restoration Plan” that will link the Cherokee Park area with the Ohio River via a shared-use path. The plan has drawn a lot of attention from the cycling community and citizens throughout Louisville. The latest meeting, at the Clifton Center, included a bit of background from the last meeting held in August including comments, suggestions, concerns we received then. A detailed discussion of several alternatives throughout the stream corridor from Lexington/Grinstead to the confluence with the Ohio, including a little bit of the South Fork of the creek, also followed. Some alternatives have some pretty big and cool ideas such as following the old route of the Big Four rail line as it came south of the river into the city and using a spiraling bridge structure similar to what Waterfront Park has at the Big Four Bridge. They are calling it “The Little Big Four Bridge. ” It would be the most costly, but is about the only way to have a route that follows the creek, stays off the street, and is able to navigate the big obstacles such as existing railroad, interstate highway and a bridge over the creek that has no possibility of a path going under it. It would be an amazing, iconic landmark if it were to go forward. There are other more circuitous, partially on-street routes which are less costly as well. There was a good Q & A after the presentation. Mostly the questions were about how would this be funded, possible timeline, “what does it take for the project to go forward”-kind of questions. There was interest in a nearby impound lot and doing something more productive and environmentally friendly with that. There was a lot of interest in the stream restoration ideas. At the next meeting, possibly in early December, will present final recommendations about the routes and stream restoration after comments from this meeting have been considered. If you’d like to check out the presentation from the Oct. 17 meeting, please click here. Warning, it’s a sizable file, but it’s worth opening and checking out! Over the summer break, thousands of kids throughout the city will participate hundreds of camps including a wide variety of sports camps aimed at keeping kids more physically active and learning new sports skills. From soccer to baseball, from lacrosse to volleyball and Golf, thousands of kids will enjoy the fun and the instructional benefits. Louisville Metro Parks & Recreation has joined countless other organizations including JCPS, the Louisville Free Public Library, Metro United Way and others of going a step further by developing an coordinated Out of School Time (OST) schedule that not only includes the summer break, but also winter/holiday and spring break OST activities and programs. “The correlation between out-of-school time and youth success is undeniable. Studies show that youth who attend out-of-school time programs are 12% less likely to drop out of school compared to their peers who don’t participate. And quality out-of-school time programs are universally recognized as critical tool to help students graduate on time – contributing positively to key performance indicators such as attendance, engagement in learning, test scores and grades. With an estimated 1,200 students in Louisville alone predicted to drop out of school this year, and 44% of children in Kentucky indicating they would attend an out-of-school time program if one were available, the need and value is obvious. BLOCS’ goals are to set quality standards or out-of –school time programs, inciting participation by out-of-school time program providers, and motivating out-of-school time program providers strive. One of the partnerships that Louisville Metro Parks & Recreation established is with Robbie Valentine’s Basketball Camps. The Robbie Valentine Basketball Summer Camp is a youth summer camp for boys and girls, ages 6-16 that emphasizes individual instruction in all phases of the game. Campers can expect to learn the key fundamentals of being a better basketball player in areas including defense, shooting, passing, ball handling, team work, and leadership. Valentine brings in current and former players & coaches such as Denny Crum, Rick Pitino, Milt Wagner, Tony Branch, Jack Givens, and others. Valentine, a former U of L basketball player and a successful product of a single parent household in Hardin County, has been hosting basketball camps for more than 30 years. He began working with Louisville Metro Parks & Recreation in an attempt to reach inner city youth who may not have a father at home. “The mentors I had growing up changed my life. They taught me I could achieve. I’m inspired to give back to others as others gave back to me”, said Valentine. “He always starts out (by saying), ‘Tuck in your shirts, tie your shoes, pull up your shorts because the image you present is how people are going to perceive you,” Ben Johnson said. Johnson an Assistant Director overseeing Louisville Metro Parks’ Recreation Division. Valentine tells campers at the onset that his camps are just as much about developing successful young men and women in the classroom as they are about improving their skills on the court. He gives them the option of leaving the camp if they refuse to comply. Since 2014, Louisville Metro Park & Recreation has had hundreds of kids from several of the community centers including Baxter, California, Parkhill, Portland, South Louisville and others attend the camps. “Our ultimate goal is to keep kids involved in a positive, safe and nurturing environment,” said Johnson. 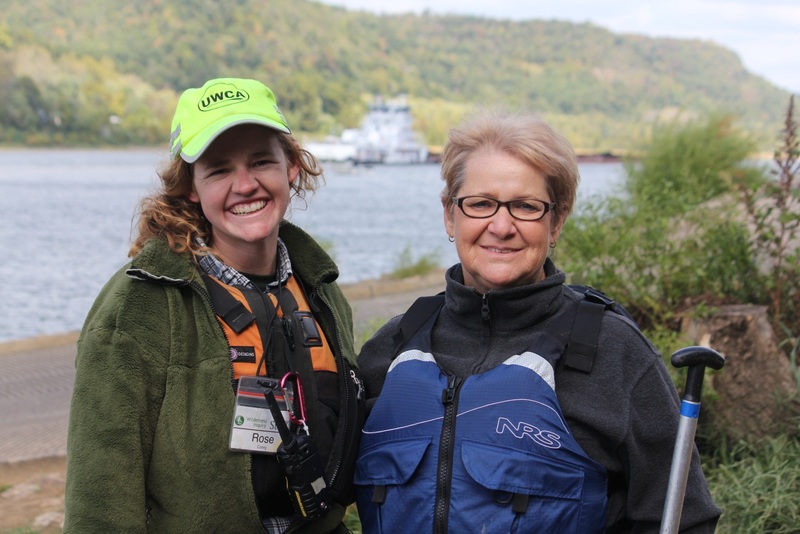 Last weekend, I had the pleasure of traveling down to the beautiful Riverview Park to capture some photos of Jefferson Memorial Forest’s Canoemobile Event, which offers free canoe rides for individuals and/or families. But before I could even get the camera out, I was once again enthralled by the beauty of this park. It’s a hidden oasis of 46+ acres running along the Ohio River in Southwest Jefferson County at the end of Greenwood Road. I must admit, Riverview Park is one of my favorite parks in the city. Why? This park is situated along the river bank, offering a quiet, picturesque view of the Ohio with a backdrop of lush landscape highlighted by crisp, green leaves with hints of blazing orange and red foliage amidst the rolling tree canopy. It’s beautiful! As I pulled out the camera, I rushed down to the water to capture a couple of families arriving back to the dock after their paddling experience; the grandparents and their grandchildren, along with a father of two boys, all smiling ear to ear! 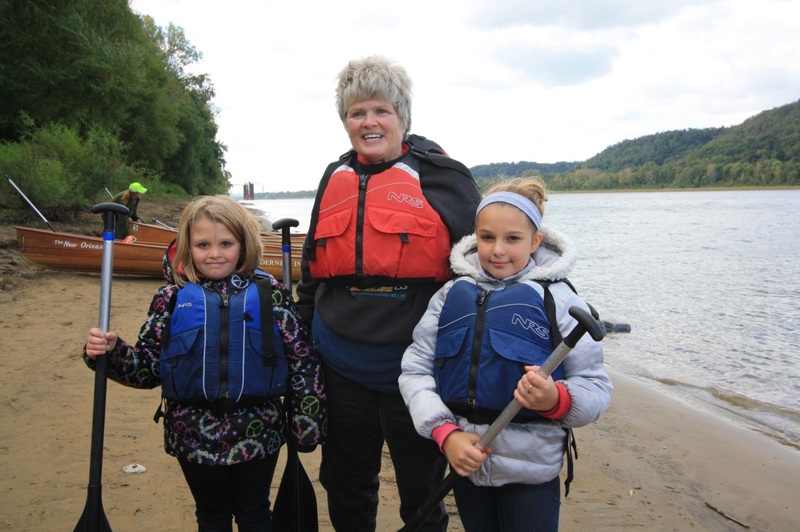 For the children, this was their first paddling experience. 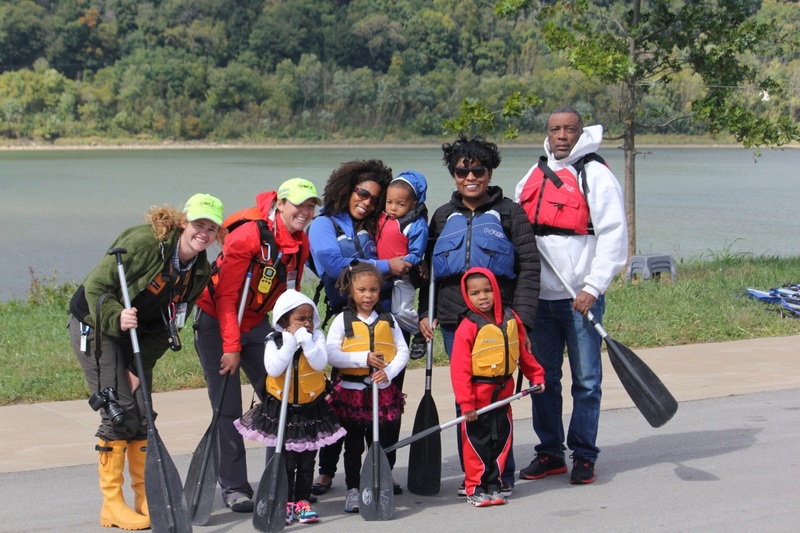 Moments later, another canoe arrived filled with young ladies participating in a YMCA mentoring program from Southern Indiana. While still a little nervous, two of the participants told me that they had a blast! 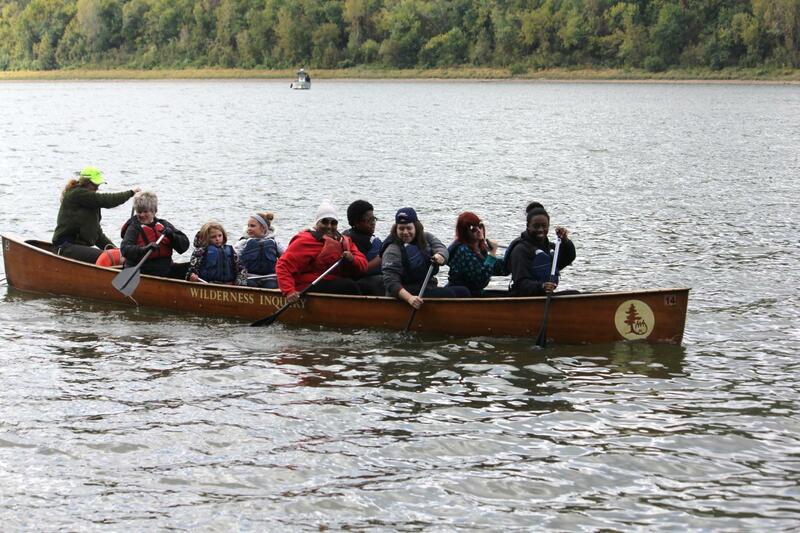 All admitted this was their first time canoeing, but it wouldn’t be their last. That’s exactly what organizers wanted to hear. 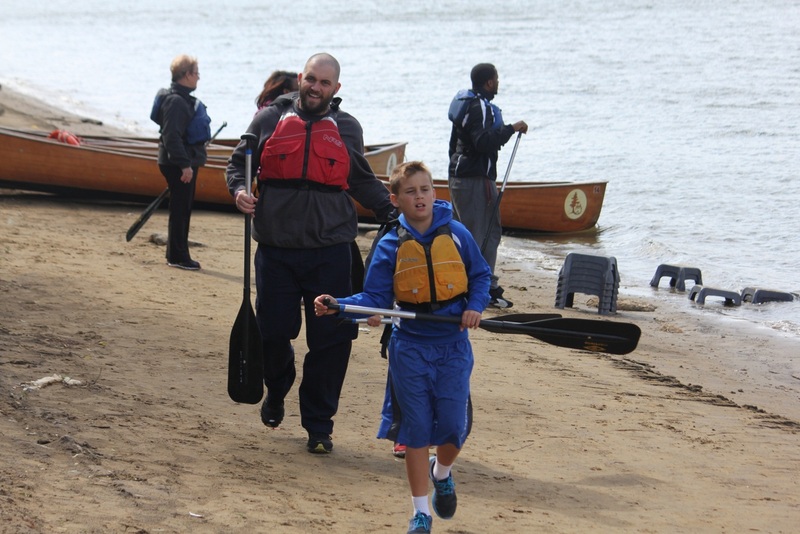 The purpose of the Canoemobile program is to introduce youngsters and families to canoeing and other outdoor activities, all aimed at promoting environmental education and stewardship and physical activity in the outdoors. The program is also part of larger urban outdoor initiative with the United States National Park Service, which is focused on introducing urban residents to the beauty of the outdoors. 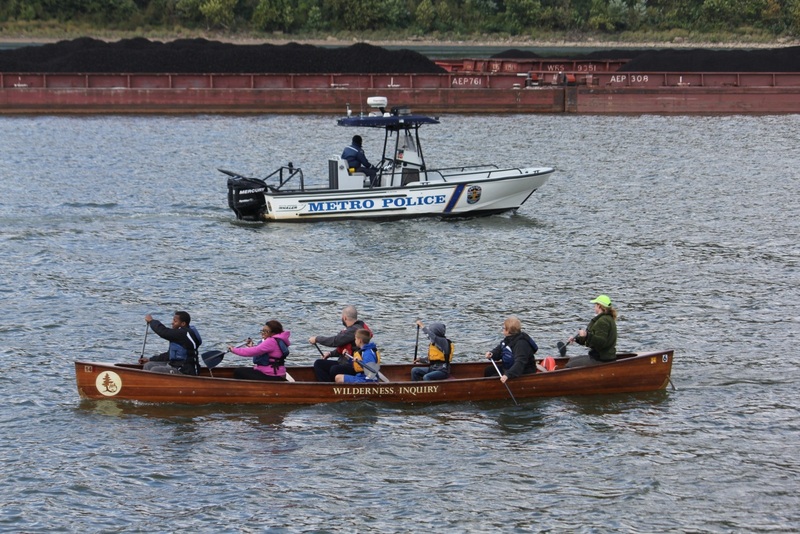 The canoe rides, in partnership with the Urban Wilderness Canoe Adventures (UWCA), launched from Shawnee Park on Friday, October 3, and Saturday, October 4 from Riverview Park. Despite the rainy and cold weather, more than 350 participants took part in the activity. What I enjoyed most about this event was the family-fun atmosphere. 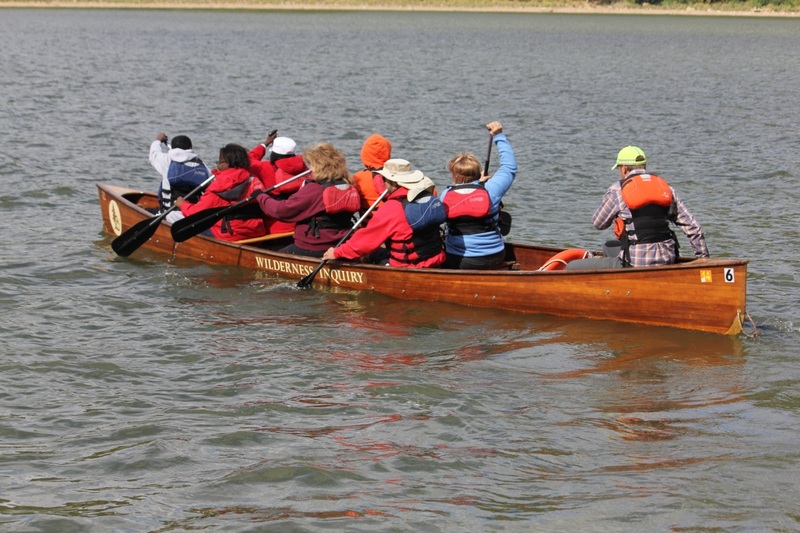 It was interesting to watch many of the participants quietly (often a little reluctantly) meander down to the canoe in the beginning, yet confidently exiting the boat laughing and reminiscing about their journey up/down river at the conclusion. Sometimes it was the child/teen holding the hand of the parent/grandparent who was obviously the one nervous, and at other times it was vice versa. While I personally was unable to overcome my fear of water and participate, I was impressed by the number of people who were. Some even acknowledging they now could mark this off their “bucket list”. Registration for Men’s 18 & Over Basketball League is open now through January 2, 2014. First week of league play begins January 7. Games will be played on Tuesday evenings (6:30, 7:30, 8:30 & 9:30 pm) at Cyril Allgeier Community Center. Questions? Call the Athletics Office at (502) 456-8117. Important Note: Payment must be made in full at the time of registration in order to reserve your place for the season. Register at the Athletics desk inside the Louisville Tennis Center located at 3783 Illinois Ave. Louisville, KY 40213.